Wide Jump Ups - start standing with feet together, then jump up and land in a wide stance on step, then jump back into starting position. Crossovers - with weight in hand, start with one leg on step in squat position then crossover into squat position on other side and repeat. Slow Straddle Jumps - start standing on bench then jump down (like jumping jack) landing in deep squat then jump back up in deep squat. Air Jacks - start with feet together then jump up before sending legs out to the side. Tuck Jumps - start with feet together then jump up bringing knees up high. Plunge Lunges - Alternating rear lunges off step with a jump switch, also includes low pulses. My descriptions are probably far more confusing than the actual move itself. Plyo moves tend to be so simple, but somehow so effective. Do you have a favorite plyo move? Today I really had hoped to get up and run early. It's starting to be fairly warm by lunch. It's now light enough around 6:15 am, that we could get up and get in a run before work (and not at some ungodly hour) and I'd only have to come in about 20-30 minutes later (so closer to 7:30). Towards the wee hours, however, I just started tossing and turning and not getting any sleep. So I reset the alarm. We were lucky today actually. It was still fairly nice when we did go for our run at lunch around 11:30. The humidity seemed lower and there was a nice breeze (not a gust). We opted for some stride drills again just to break up the monotony of the typical 3 mile loop that we do. We jogged over to a nearby park and did 10 total intervals before jogging back to the house. I must say that those drills really work my quads and hams and make me realize just how much I need to be working my legs more! After work, I decided to do a kickboxing workout to loosen up the legs, work the abs and arms all in one shot. This also rounded out my cardio time to just at an hour. I stretched for a bit after as well. I'm having some major issues with the uppermost ham/lower glut area. It started last year and flares up the most when I do anything hamstring related. This stinks in terms of trying to strengthen that area. Anyway, I have been trying to be even more diligent about my stretching. It was such a beautiful evening, I just couldn't pass up grilling out and enjoying the patio time. 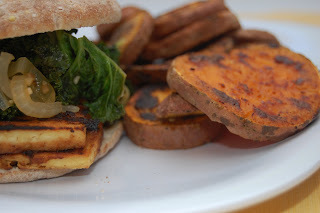 I decided to do BBQ Tofu Sandwiches with Sweet Potato Rounds. I also did a Sweet n' Spicy Kale to top the BBQ Tofu with. The BBQ Tofu was super simple. Just squeeze out frozen and thawed tofu, cut into slabs and marinade in your favorite BBQ sauce, then grill. In small bowl, whisk together OJ, agave nectar, garlic, and chipotle. In large non-stick skillet, saute onions in small amount of olive oil or water until soft. Add in kale, OJ mixture, salt and pepper. Let saute until soft. I served the tofu on sandwich things so they looked a little odd, but they tasted good! The kale turned out great, not too spicy and not too sweet. It would be great as a side or even over a grain like quinoa or barley. Sounds wonderful, I'm going to try it real soon. LOVE plyo moves - though I'm the WORST jumper known to mankind. I can't do those tuck jumps nearly as good or as cleanly as they can!! I'm bummed - was going to run after work since it's been so nice here too but ran into a major thunder and rainstorm right as I got home from work. Boo! Looks yummy! I had hammy problems all last year. Lots of icing and stretching. George Ann (aka 2nd mom) thank you for commenting. We need to get together soon; it's been far too long! Jessica @ EatDrinkBreatheSweat I think I like plyo b/c of my dance background which included lots of jumping. Now...how do I look?? Don't even want to know! That stinks about the storms. Maybe a run tomorrow?? Naomi @ The Tao of Me I just keep stretching, been using a tennis ball, just can't loosen it up. I'm afraid it's a pinched nerve :-( Not giving up though! I totally envy you and your workouts and you plyo.....ugh I wish I enjoyed it more, as I know it is so beneficial for you! What a perfect dinner for eating out on the patio! I have some plain tofu to use up and might marinate it in BBQ sauce. Yum! Kris @ iheartwellness I think it's important to do the type of workouts we enjoy the most. If not, then we won't do them at all right?! Glad to hear you had a nice lunch run and dinner on the patio. Sounds like a great day to me. 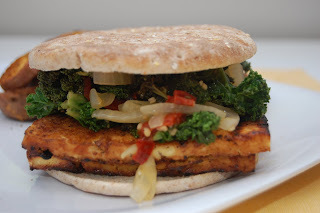 Yum, the recipe section features two of my favorites: kale and bbq tofu...the combination you created sounds wonderful...great idea, thanks for the recipe! I just made grilled tofu for the first time and it was basically life alteringly delicious. Barbecue sauce is an obvious next step, especially since yours looks soooooo yummy! Averie @ Loves Veggies and Yoga This kale was fantastic. I was really happy with how it turned out. Great suggestion on the tofu. I know it scares a lot of people - it used to scare me! Alicia @ Vegan Epicurean LOL - if you love torture there is ;-) I like that you have to categorize by hate the least teehee. Kelsey @ Snacking Squirrel I just love being able to be outside after winter. We have some major mosquito issues here too. We use a fan and that seems to help. They seem to not like the wind it creates. Rose @ Dandelion I had honestly wanted to do a slaw, which would be traditional for a BBQ sandwich, but I didn't have everything I needed so I just subbed with the sauteed kale. It really created a nice balance of textures too. Lele @ Lele Lurves Plants I think once you make a really good tofu dish for the first time, it really changes your mind on tofu in general. Good job! Nothing (and I mean nothing) makes me as sore as plyo moves...love them!! kale is such a great veggie - i love the idea of it cooked, in a sandwich! Sweet & spicy kale sounds tasty! Thanks for the plyo move suggestions! My favorite are jumping lunges, even though they kill me every time. I've been slacking on my plyos. Time to step it up! The Actors Diet believe it or not, I am just now getting into using Kale. I was always afraid of it b/c people talked about how bitter it could be. I adore it in soups too. Kalli @ Fit and Forty Something LOL sometimes I'm not sure what I'm doing either! All I now is that my HR goes sky high and my legs hurt. Kate @ What Kate Ate The flavor combo for the kale worked really well, especially if you like spicy foods. Eunice @ rainbwsnkittns Oh, gotta love those jump lunges. One I hate is mountain climbers. Kills my hip flexors and I just don't see the purpose. I love doing plyo. My sister has P90X and I borrowed the plyometrics DVD. Man, it's tough! I have baked and sauteed, now I am excited to know I can try grilling my tofu! This sounds great! Kristen @ Swanky Dietitian I so want to try the cardio P90X workouts! Oh, grilling is one of my favorite ways to make tofu.